Agatha Christie’s record-breaking play, The Mousetrap announces a brand new West End cast from 21st December 2015. 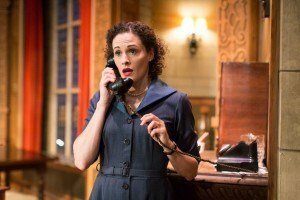 Visit here for the current cast of The Mousetrap. Joining the London production, which has been running for more than 60 years, are Emma Deegan and Rob Heanley as Mollie Ralston and Giles Ralston. They, in turn, are joined by Timothy O’Hara as Christopher Wren, Eunice Roberts as Mrs Boyle, Laurence Kennedy as Major Metcalf, Jocasta King as Miss Casewell, Philip Cox as Mr Paravacini and Eddie Eyre as Detective-Sergeant Trotter. Taking over from the current company, the new West End cast play their first performance in the infamous murder mystery on Monday 21st December 2015. 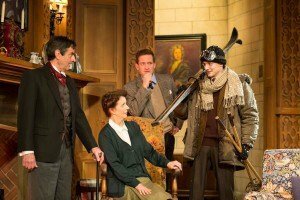 The Mousetrap is based on Agatha Christie’s radio play, Three Blind Mice, and is a whodunit story featuring an assortment of guests snowed in at the Monkswell Manor with a murderer on the loose – but which one of them is the killer? The stage play made its world premiere at the Theatre Royal, Nottingham on 6th October 1952 and embarked on a pre-West End tour before opening at the Ambassadors Theatre on 25th November 1952, with Richard Attenborough and his wife Sheila Sim starring in the original London cast. It transferred to the St Martin’s Theatre on 23rd March 1974 without missing a performance. 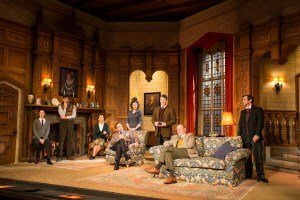 The Mousetrap, which celebrated its 60th anniversary in the West End in November 2012, holds the Guinness World Record for the ‘longest continuous run of any show in the world’ and has played over 26,000 performances to audiences in London. 442 actors and actresses have appeared in the play since it opened, and it has been presented in 27 different languages in more than 50 countries. To coincide with the Diamond Anniversary – 60 Years celebrations, the first UK Tour opened in Canterbury in September 2012 and is still running to this day, with dates currently extending into 2016. 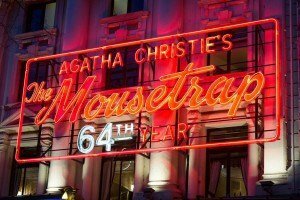 The play’s 60th anniversary was also marked with a Gala Performance in support of Mousetrap Theatre Projects, which includes such stars as Julie Walters, Patrick Stewart, Miranda Hart and Hugh Bonneville, and the unveiling of a memorial to Agatha Christie. In addition, 60 productions were licenced around the world in such countries as Australia, Turkey, France, Russia, China, South Africa, Korea and the USA. The cast has been changed annually since the retirement of former cast members Mysie Monte (Mrs Boyle) and David Raven (Major Metcalf), who spent more than 11 years in The Mousetrap. It does however still features original cast member Deryck Guyler – the late actor provided the pre-recorded voice of the newsreader in the first Act before his death in 1999. It is also notable for the secrecy surrounding its twist ending – audiences and members of the press are asked not to reveal the plot of the play, or the identity of the murderer. The Mousetrap is written by Agatha Christie and directed by Ian Talbot. Original producer Peter Saunders handed over responsibility to new company Mousetrap Productions, under the management of Sir Stephen Waley-Cohen, in 1994. Age Restrictions: Recommended for ages 12 and over. London Theatre News, Reviews and Tickets for West End and Off-West End.